Within the P.I.E. chart, each wedge of the circle represents one meridian pathway. Those shown in green are balanced and functioning properly. Colors that do not extend to the edge of the circle identify and classify your meridian energy imbalances. Your P.I.E. 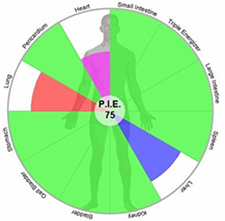 (Personal Integrated Energetics) score includes a complete analysis of all your meridian pathways and reflects the overall health of your meridian energy system. A perfect score of 100 reflects complete balance and unimpeded flow of your Qi energy. A lower score means there are various imbalances that you and your healthcare practitioner should address together. Why Did We Choose AcuGraph? AcuGraph is the premiere measurement tool of its type on the market today. It provides a fast and efficient exam, gives the most advanced treatment options, and allows us to easily track your progress. AcuGraph is the natural choice for analysis because we are committed to high-quality care and outstanding results. We insist on providing the highest quality care, and this is the most important reason we have chosen the AcuGraph system. The AcuGraph exam will show you the balance of energy in your acupuncture meridians. This balaknce, or lack of balance, is an important key to understanding the state of your health and potential health issues. Your practitioner will help you understand the exam results in the context of your current condition.